Thornby is the smallest village in the group, clustered around the A5199, south of J1 on the A14. The 16th century pub stands by the road, and is more visible than the church which is set back from the road on the opposite side. A large part of the village still belongs to one family. The church owns two fields; one is rented to a local farmer, and the other is the Poor’s Land. The rector of the parish has historically been a trustee of the Poor’s Land. Several of the houses are on assured shorthold tenancies, but the majority belong to long-term residents. When the church school closed, the School House was sold as a private dwelling, but the Diocese retained the School Room. It is currently leased to the Village Hall Committee, and used as a Village Hall. The church gets a small rent and has free use of the Hall once a week. The Hall has suffered with extensive dry rot, but has recently been refurbished, with financial help from BIFFA, who have a nearby landfill site. A weekly fitness class has now started, and it is hoped to found a Youth Club. The font has fragments of ancient carving around it, probably older than the medieval church fabric. 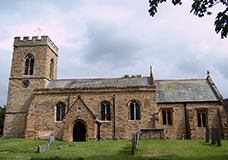 A substantial North Aisle was added in the 19th century, and a pew was removed in the 1920s for the Duke and Duchess of York who came to church here. The Yorks took a house in Thornby for the hunting for several seasons, and they are still remembered. After the 2000 quinquennial a major restoration had to be carried out, and by last year the interior was dry enough for the interior to be redecorated. It is now in excellent shape. For the last few years the congregation has lost more than its fair share of its loyal and active members, with more funerals than weddings, and hardly any baptisms. Some did not like the change of one service from nine to eleven o’clock, but the change did seem to enable one or two new people to join us. The times of 8.30 and 11 am suit different peoples needs. Recently we have had an increase in the children in the village and have had good congregations for the harvest festival and the carol service. We hope to keep this interest going with more family oriented services this coming year. Two baptisms are already booked for June. There is an 8.30 service once a month. The organ has recently been refurbished, and one of the churchwardens plays for us, with help from an organist from a neighbouring village. The other churchwarden is a sacristan and treasurer. The short-lived benefice of Cottesbrooke, Great Creaton and Thornby was suspended in 1983, and remains so today. Before that, Thornby was united with Cold Ashby for half a century. The Cold Ashby names are still read out with the Thornby ones on Remembrance Sunday. For pastoral matters or to enquire about services, please contact the Rev. Chris Peck or the group administrator, Katrina Jones. Details for both can be found on our Contact Us page.